Augmentative and alternative communication (AAC) includes all forms of communication that are used to express ourselves without the use of oral speech. We all use AAC when we make facial expressions or gestures, use symbols or pictures, or write. Augmentative and alternative communication is used by individuals to help compensate for severe speech-language impairments in the expression or comprehension of spoken or written language. 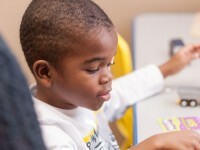 An evaluation of an individual’s abilities, limitations and communication needs is necessary to select appropriate AAC techniques. The purpose of the assessment is to identify potential AAC approaches that can bridge discrepancies between a potential user’s current communication and their present and future communication needs. AAC evaluations are conducted by our teams of speech-language pathologists. Many different AAC methods are used by people of all ages with various physical or learning difficulties. AAC includes both unaided and aided systems. Unaided systems, like signing and gestures, do not require special materials or equipment. Aided systems range from paper and pencil to communication books or boards to devices that produce voice output. AAC methods vary and may be personalized to meet each individual’s needs. Many forms of AAC include an assistive technology component which range from high- to low-tech strategies.